Check us out at the #AIHAce EXP. Find us at booth #1826. On-Target® water testing kits for chlorine now available! NAtional Moscow mule day: HOW MUCH DISSOLVED COPPER IS IN A MOSCOW MULE? Any true fan of Moscow Mules will argue that the drink needs to be served in a copper mug. But just how much of the copper from that special mug leaches into the drink? And how much copper is dangerous for a person to consume? The Access Sensor Technologies’ team did some digging, and this is what we found out. First, why is the Moscow Mule drink served in a copper mug? We won’t go into detail here, but a good description of the history of the drink and why it is served in a copper mug can be found at this link, https://bit.ly/2PHn4q9. Image of the On-Target® copper testing card used to measure the copper concentration in the residue of a Moscow Mule. Next, how much copper is safe for us to consume? Well, like for every chemical, the dose makes the poison. Copper is actually a necessary component for multiple enzymes in the human body. The Recommended Dietary Allowance (RDA) for adults is around 1.0 – 1.5 mg per day https://bit.ly/2ziNxjy, and is less for infants. The EPA has an action level for drinking water at 1.3 mg/L, also reported as 1.3 parts-per-million, or ppm for short https://bit.ly/2udAnml. So are Moscow Mules unhealthy from a dissolved copper standpoint? The answer depends on who you ask. There have been recent news articles claiming that Moscow Mules could contain toxic levels of copper https://wapo.st/2TuiXvJ, and news articles that report claims of Moscow Mules being dangerous are just “chemophobic fear-mongering” https://bit.ly/2A8ClW9. It is true that acidic beverages in contact with solid metallic copper do start to dissolve the metal into solution, and it is true that the components of a Moscow Mule would make the drink acidic, so being inquisitive chemists, we had to investigate! Our sample was the residual fluid (~1 mL) in a Moscow Mule mug that had been sitting in the mug overnight for approximately 9 hours. The sample had a pH of 5 – 6 due to the acidic ingredients that go into making a Moscow Mule. We added 150 µL of the sample fluid to an On-Target® copper testing card. The results were… 55 ppm copper! What are the conclusions? A drink containing 55 ppm of copper would be dangerous to drink in large quantities, however, the initial sample volume was only ~1 mL which would equate to a total of ~0.05 mg of copper which is still well below the RDA value for copper. Moscow Mules are an acidic drink that will begin to dissolve copper into solution if contained in a copper mug. The results of our On-Target® copper test confirmed this, but does this make Moscow Mules unsafe to drink? Our answer is probably not. Unless you have a sensitivity to copper, or are an infant, you can probably continue to enjoy Moscow Mules in moderation. We do however strongly recommend not storing food or drinks in copper containers over long periods of time, as the dissolved copper concentration would likely continue to increase. Remember, our sample was taken after the remainder of the drink had been sitting at room temperature over many hours. The concentration of dissolved copper in a freshly made Moscow Mule is likely much lower, although we are looking for volunteers who are fans of the drink to test this for us! Thanks to one our biggest fans for submitting the Moscow Mule sample and thank you for reading! 1) Cadmium is naturally occurring and can be found in small quantities in the Earth’s crust. 2) The most common uses for cadmium include batteries and electroplating, but cadmium is also used in some solar panels, televisions, pigments, and nuclear reactors. 3) Cadmium is highly toxic to humans and animals. If you are interested in testing water or an industrial process for cadmium, check out the new On-Target® Cadmium water testing kits now available on Amazon. Check out On-Target® Cadmium tests on Amazon here! Have you heard about our new Manganese Card? Are you interested in learning about how the UPAS has been utilized in research projects? Click on the red article links below to read about how different groups have incorporated the UPAS into their work! A low-cost particulate matter (PM2.5) monitor for wildland fire smoke. On-Target® is an officially registered trademark with the United States Patent and Trademark Office! Access Sensor Technologies has been working on creating cards that meet your testing needs. Check out the new On-Target® Manganese cards! Email contact@accsensors.com to become a beta tester. Happy Holidays from access sensor technologies! Access Sensor Technologies (AST) worked with the National Oceanic and Atmospheric Administration (NOAA) to deploy a network of Air Sampling Stations in Fort Collins, CO. The goal of this project was to address existing challenges with low-cost (<$200) aerosol sensors that operate on the principle of light-scattering nephelometry. These low-cost sensors, which have become widespread over the past decade, need a reference monitor because the data quality provided by these sensors is often unknown and time-variant. Current reference monitors, known as Federal Equivalence Monitors (FEM), are bulky and expensive. The goal is be able to use our less expensive and portable Ultrasonic Personal Air Sampler (UPAS) as a reference monitor in low cost sensor networks. To test our UPAS against the gold standard FEMs, we designed and built self-powered outdoor aerosol sampling boxes that integrate our UPAS with low-cost light scattering devices. We deployed an array of these boxes throughout Fort Collins, and several of the boxes were installed next to FEMs. Throughout the six-week deployment we collected over 500 filter samples and logged nearly 15,000 hours of light scattering aerosol data. Following data analysis, we will know if the UPAS can be used as a versatile, less expensive, calibration tool within a low-cost sensor network. Thanks to NOAA, Colorado State University, and the City of Fort Collins for helping with this project! Old house? New house? The concentration of metals and other contaminants present in your home’s plumbing can change over time. Just because a house is brand new doesn’t necessarily mean the water coming from the tap is safer. Often new houses with copper plumbing can have higher concentrations of dissolved copper in the tap water since it takes time for a protective coating to form on the inside of new pipes. Older houses can also have metals from various sources present in the tap water as the plumbing begins to degrade over long periods of time. Tap water collected from an old house in Loveland, Colorado be seen in the bottle to the left. This water was collected from a rarely used basement tap in a house that is sixty years old. The water has a brown tint because it had been sitting in pipe for an extended period. Access Sensor Technologies’ On-Target® Water Testing Kits revealed that this discolored tap water had concentrations of 1 ppm copper and almost 10 ppm zinc. This test is a good reminder to test your tap water for metals if it is discolored or has an off-taste. Thanks to Julie and David for sharing their On-Target® water testing results! Thanks to all of our wonderful customers who have trusted the UPAS for their work! Happy Thanksgiving from the Access Sensor Technology team! Top Row, Left to Right: Location of Villa El Salvador, Peru. A large plastic barrel that is used for water storage that was one of the sampling locations. A sink used for cooking and cleaning that was another water sampling location. Bottom Row, Left to Right: A photograph of the Villa El Salvador trip. On-Target® Water Testing Kitsin action. 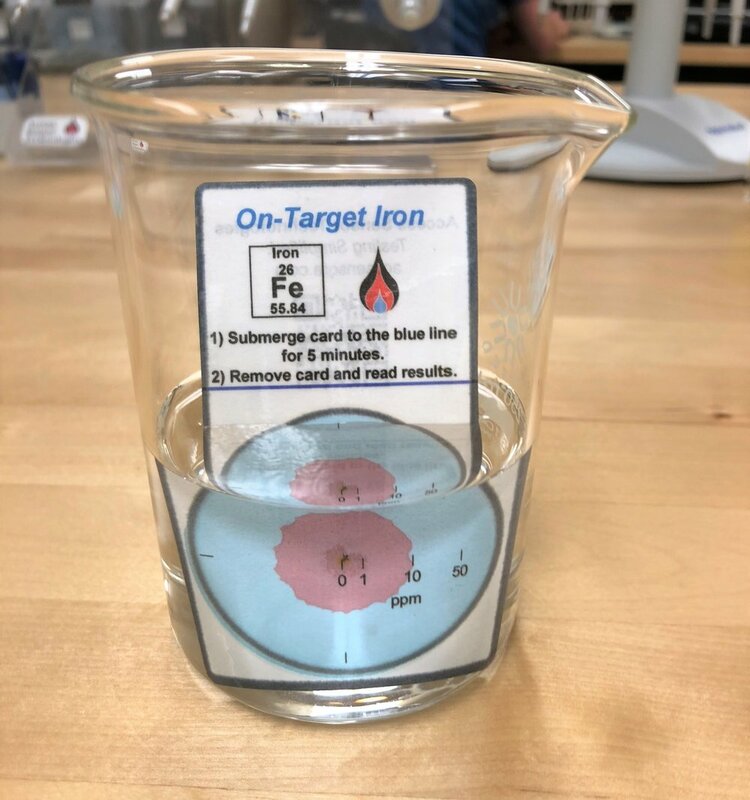 A On-Target® test card used for quantifying dissolved copper in water. This summer, Hana O-Hagan, a student at Creighton University, traveled to Villa El Salvador, Peruto test water quality at various locations in the community. Access Sensor Technologiesdonated On-Target® Water Testing Kitsto Creighton so that Hana would have a portable, easy-to-use test she could use at the sampling location. Hana used On-Target® Water Testing Kitsto analyze water that was used for cooking, drinking, and cleaning at 23 locations in the village. Hana was investigating to see if any of these water sources were contaminated with toxic metals. Back in the United States, Hana will use atomic absorption spectroscopy on the same water samples to see how laboratory data compares to the On-Target® results from the sampling locations. Our team at Access Sensor Technologies would like to offer a huge thanks to Hana, Dr. Erin Gross, and Creighton University for the amazing work they do in Peru, and for allowing us to be involved with such a great project! We will provide an update on the exciting work that Hana is finishing up soon! Some images from Hana’s trip can be seen below. 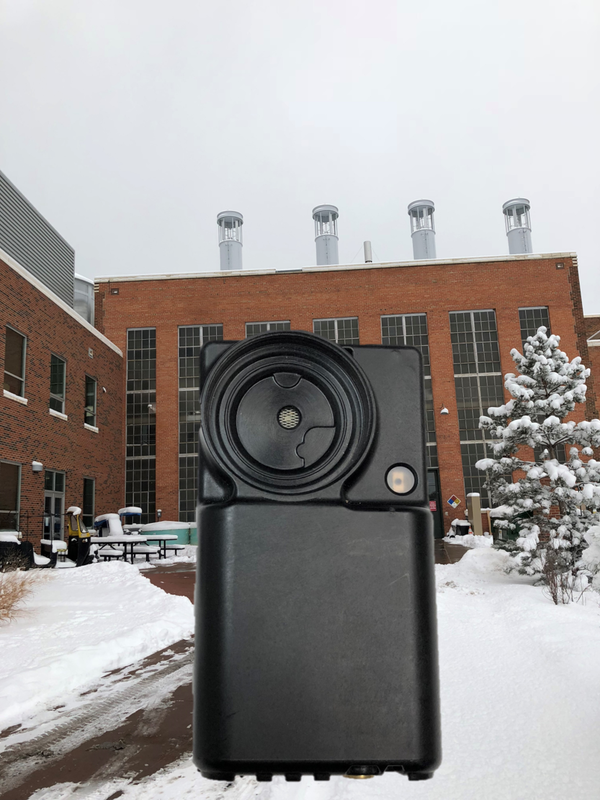 Access Sensor Technologies is working with the National Oceanic and Atmospheric Administration (NOAA) to deploy a network of Air Sampling Stations in Fort Collins, CO. Through this project, we aim to test and validate a calibration solution for low cost light scattering sensors that have been making way into aerosols research and citizen science. Happy Halloween from the Team at Access Sensor Technologies! Let us brew up something magical to simplify your sampling! Contact us today to learn how we can help make your sampling needs less spooky! crawl on over to our youtube! On-Target® cards. A fast, easy, and inexpensive method of sampling water. For more on the On-Target® cards click below! Dirt + New Prototype + On-Target™ = Remote Results FAST. Access Sensor Technologies has built functional prototypes of a tool that can extract heavy metals from soil samples in the field. These extracts can then be analyzed using our On-Target™ technology. We are currently field testing these prototypes in the mountains of Southern Colorado. For more info, contact us at info@accsensors.com. Mark Schleiger, CEO at Access Sensor Technologies, spoke at a professional development workshop last weekend at the Ranch. Mark shared some of his tools and concepts on how to create a successful startup based on his extensive experience. Thank you PMI Mile Hi Chapter for hosting this great event! More info can be found at http://pmimilehi.org/. Our team strives to always put our customers first, so please don’t hesitate to contact us if you have any questions about our products. Did you know that PM2.5 levels are generally higher during the winter months? Stay educated on the air that you are breathing this winter with the UPAS. 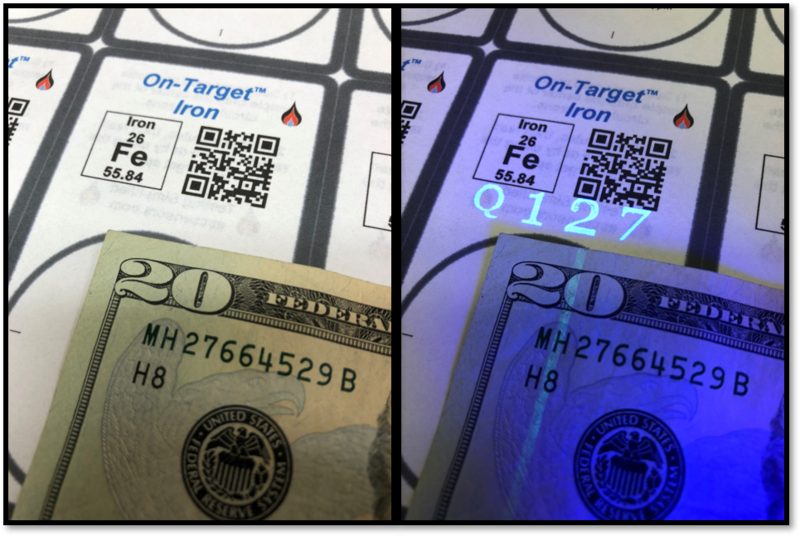 Invisible fluorescent Ink is handy for leaving secret messages or combating counterfeit money. At Access Sensor Technologies, we use custom invisible inks for QC and tracking purposes of our On-Target® technology. Happy #FluorescenceFriday! Testing for air pollutants? Check out our UPAS device! It’s a modern, lightweight, quiet, and reliable unit anyone can wear. How much money would you save if you could eliminate 3rd party laboratory testing from your business’s workflows? Call us to learn how On-Target® water testing tech can dramatically reduce your testing expenses. Our team’s agile development practices allow us to determine feasibility, prototype, test, and deploy new water tests extremely quickly. If you have a need for a water testing solution, get in touch with us. Let us know what you are interested in testing. Let’s see how we can help each other. Sampling metals in water does not need to be expensive and untimely! On-Target® cards enable you to get your water test results in minutes! wondering if your water is clean? Water is essential to life, that is why at Access Sensor Technologies we work hard every day to develop technology to make water monitoring accessible to everyone. Please take a moment this #WorldWaterMonitoringDay to see how our team is improving water monitoring technology. No more hauling around big, heavy, distracting, expensive air sampling equipment. Access Sensor Technologies’ UPAS makes air sampling simple by providing significant decreases in sound, weight, size, and total cost of ownership. Check out the UPAS today to make your sampling simple. 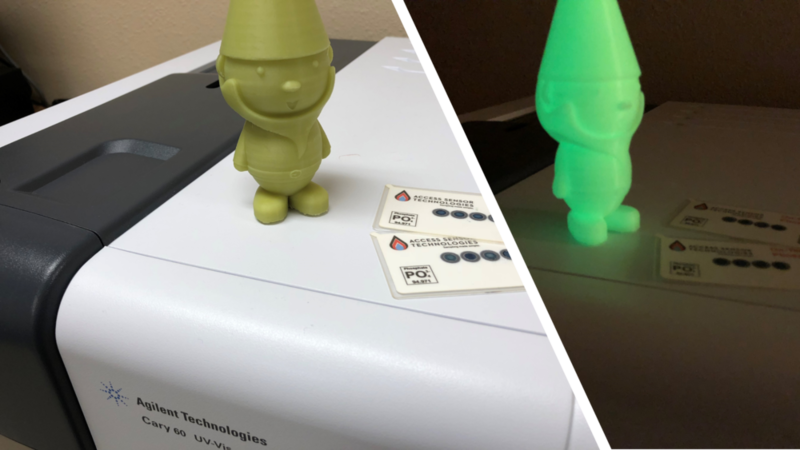 Check out our 3D printed phosphorescent gnome hanging out with our new On-Target® phosphate test cards this #FluorescenceFriday! Thank you to American Industrial Hygiene Association (AIHA) / AIHA - Rocky Mountain Section! We had a great time at the conference this year! The AIHA Conference is this week and we are excited! Don’t forget to stop by our booth ato learn more about how Access Sensor Technologies makes industrial hygienist’s jobs easier by making sampling simple. The UPAS makes industrial hygienist’s jobs much easier by creating a way to sample air in a simple and less obtrusive way. Come check it out at our booth at the AIHA conference! We hope to see you at the AIHA Conference this month in Arvada, Colorado where industrial hygienists will be gathering to learn about improving safety and exposure in the workplace. We will be hosting a booth and showing off our innovative technologies that make sampling simple. Come stop by, we would love to meet you! Let us know if you will be there so we can connect! The ISES-ISEE Joint Annual Meeting starts in just a few short days and we are excited! Stop by our booth to meet Dr. Thomas Reilly and Daniel Miller-Lionberg to learn more about how Access Sensor Technologies has made sampling simple for epidemiologists! Are you ready for the revolution? Develop and apply traditional and innovative methods for assessing exposures to environmental stressors and their health effects. Address exposures to a broad array of environmental stressors as well as factors that contribute to or mitigate exposure. Elucidate potential health effects from environmental stressors during the life cycle including outcomes from in utero development to death. Promote interdisciplinary approaches to solving complex environmental public health problems. As the capital city of Canada, Ottawa is home to diverse and active community of scientists and policy makers engaged in local and global environmental exposure and health research. The ISES-ISEE 2018 Joint Annual Meeting will be inclusive to delegates from around the world, and will leverage local and international expertise to address complex local and global topics relevant to exposure science and environmental epidemiology. Access Sensor Technologies makes on-site water testing and data logging a breeze with our On-Target® analysis app that runs on a phone, tablet, or laptop. Simply dip the On-Target® test card into the water, wait 5 minutes, and take a picture with the app for instant quantification of any of the metals in our expanding test library! NEED HELP? CHECK OUT OUr YOUTUBE CHANNEL! 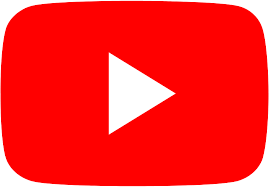 Our Youtube channel is meant for online support. Access Sensor Technology is founded on the idea that Sampling Should Be Simple. Due to that we aspire to have everything else be simple as well. Our Youtube channel holds information on both the Ultrasonic Personal Air Sampler (the UPAS ) and our On-Target Test Cards (Copper, Iron, and Zinc). Everything has been broken down for you to find what you need. The UPAS is broken down into process specific videos, allowing for time to be managed properly. On-Target card video are available to watch as well. Please Contact Us if you have any further questions, or concerns. In just the past few years, our UPAS and On-Target® technologies have been utilized across the United States and at many diverse locations around the world. Our UPAS air sampling technology has been deployed in 20 countries, and our On-Target® water testing technology has already been to 5 countries. The entire Access Sensor Technologies team would like to thank all of our early adopters and customers for helping make these innovative technologies a success!